Memorable moments are few and far between, resulting in a middling film that feels more experimental than anything else. Finnish filmmaker J.-P. Valkeapää comes up with a wild take on a boy-meets-girl story in They Have Escaped, which appropriately premieres in the offbeat Vanguard section of the Toronto International Film Festival. Using intriguing camera techniques, the film expends an excellent atmospheric tone, especially during key dream sequences. Though it’s a pleasure to look at, They Have Escaped falls apart due to its wobbly story and over-familiar subject. Memorable moments are few and far between, resulting in a middling film that feels more experimental than anything else. A stammering young man named Joni (Teppo Manner) gets assigned to live in a juvenile detention center after fleeing from a mandatory military service. Joni is a man of few words because of his embarrassing speech impediment. However, it’s not long before the introvert crosses paths with a loud bleached-blond punk named Raisa (Roosa Söderholm). She’s an attractive girl but always seems to be running from trouble and causing a scene. Although their personalities are miles apart, the two share the same urge to escape from the troubled youth center and free themselves from any kind of rules. The title of the film makes it pretty clear what happens next. Given Joni’s history of fleeing, it’s bewildering why counselors give him access to a vehicle in the first place. But for some reason they do and that makes it easy for the two outcasts to embark upon a cross-country journey. Raisa claims to have a large stash of cash in a box somewhere at home and manages to convince Joni to join the treasure hunt. Together they’re free from authority figures and conduct which allow their animalistic to shine through. One area They Have Escaped excels in is with impressive cinematography, used to transform reality into fantasy. In a haunting slow motion dream sequence, a fierce warrior charges towards the camera with an ax as if he were hunting prey. 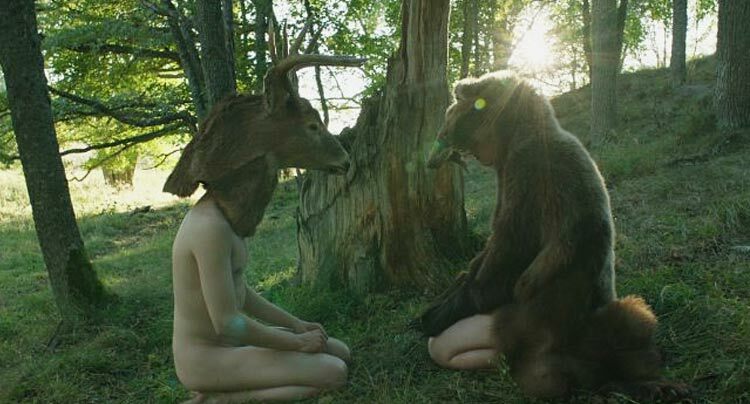 Taking this idea one step further, the two dress up as a bear and deer during a drug induced scene, thus sort of becoming animals. Red shows up more prominently as the film progresses to symbolize love, blood, and death. These stunning visuals end up being best trait of the film. Teppo Manner’s lines are kept to a minimum due to his stutter, which in return gives the film a natural subdued ambience. While there’s no problem with limited dialog, his character feels largely underwritten. Aside from one scene early on when the entire cafeteria makes fun of his stammer, there is no emotional investment into the character–which is problematic for a lead character. Söderholm’s character on the other hand doesn’t need as much exposition because her uncompromising spirit speaks for itself. Plus, Joni seems to be attracted to her mysterious motivations, so it actually works in her favor. At first it’s fascinating to watch the young couple act out their primordial instincts to be free and uncaged. However, the bulk of They Have Escaped involves them wandering around in search for treasure that likely doesn’t even exist. On top of that, it’s hard to care about the characters because they’re both so shallow. There is a brutal late development which disrupts the status quo, but it occurs too late in the film to make the appropriate impact. Valkeapää shows off his capabilities in the visual department, but his ability to craft an engaging narrative remains mostly unseen here.